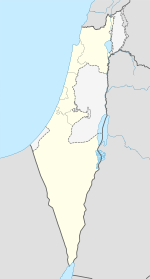 Ness Ziona (Ebreu: נֵס צִיּוֹנָה‬, Nes Tziyona) is a ceety in central Israel foondit in 1883. At the end o 2009 the ceety haed a tot population o 38,100, an its jurisdiction wis 15,579 dunams. Ness Ziona wis first kent as Nahalat Rubin (lit. "Reuben's Estate") efter Reuben Lehrer, who awned the land. In 1878, the Templer Reisler purchased lands in Wadi al-Khanin (wadi o flouers), plantit an orchard, an lived thare wi his faimily. Efter his wife an childer dee'd o malaria, he returned tae Europe. He travelled tae Odessa in 1882 an met Reuben Lehrer, a Roushie Jew wi Zionist ideals, who awned fermland thare. Reisler tradit his parcel o land in Palestine for Lehrer's land in Roushie. Lehrer made aliyah wi his eldest bairn Moshe in 1883, bringin his wife an 7 childer ower the follaein year. Lehrer placed advertisements near Jaffa port askin ithers tae join him. The pioneers established a neighborhuid named Tel Aviv (the ceety o Tel Aviv did no yet exist) awtho the aurie wis still kent bi its Arabic name, Wadi Khanin. In 1888, Avraham Yalovsky, a blacksmith, wis killed defendin his property frae Arab gangs. In 1891, Michael Halperin bought mair land in the wadi. He gathered a group o fowk on the Hill of Love an unfurled a blue an white banner emblazoned wi the wirds Ness Ziona ("Banner tae Zion") written in gowd. The name is based on a verse in the Beuk o Jeremiah, Jeremiah 4:6. This banner wis seemilar tae the offeecial Banner o Israel adoptit at the First Zionist Congress seiven years later. Ness Ziona wis attacked bi Arab forces in the 1936–39 Arab Revolt, an the 1948 Arab–Israeli War. The ootlyin veelages o Kfar Aharon an Tirat Shalom (nou pairt o Ness Ziona) frequently exchynged fire wi the Arab veelages al-Qubayba an Zarnuqa (nou wastren Rehovot). Maist o Ness Ziona's youth joined the Haganah tae ficht aff these threats. On Mey 15, 1948, Sarafand wis evacuatit o Arab indwallers, an on Mey 19, al-Qubayba an Zarnuqa wur conquered bi the Givati Brigade. Muckle o the territory abandoned bi the fleein Arab residents o nearbi veelages wis addit tae Ness Ziona, increasin its size frae 8 km² tae aboot 15.3 km² immediately efter the war. Durin the war, Ness Ziona's population amaist tripled tae acome 4,446 (accordin tae an October 23, 1949 survey), an till 1950 the local cooncil absorbed 9,000 olim, maist o whom wur hoosed in ma'abarot. In 1952 a new industrial zone wis appruived for the toun on an aurie o 70 dunams. In 1955, a seicont industrial zone wis appruived. Ness Ziona is locatit on the Israeli coastal plain approximately 10 km inland o the Mediterranean Sea, tae the sooth o Tel Aviv. The ceety is bordered tae the north bi Rishon LeZion, tae the east bi Be'er Ya'akov, an tae the sooth bi Rehovot. Beit Hanan, Beit Oved, Ayanot youth veelage an Kibbutz Netzer Sereni an aa border the ceety. Ness Ziona is nou popular amang Tel Aviv residents seekin tae leave the ceety. The rural character haes been preserved bi urban plannin that eschews skyscrapers an biggins heicher than aicht floors. Property values hae risen bi 30 percent in recent years. Ness Ziona is componed o a central core an veelages that came unner its municipal jurisdiction ower time. The ceety an aa haes twa industrial zones an a heich-tech pairk, Kiryat Weizmann. Accordin tae the Israeli Central Bureau o Statistics (CBS), in 2005 the ethnic makeup o the ceety wis 99.6% Jewish an ither non-Arabs. At the end o 2004 thare wur 612 immigrants (2.2%), awtho this rose sharply tae 7.8% in 2005. In 2005 thare wur 14,400 males an 14,900 females. 31.8% o the population wis 19 years o age or younger, 15.2% atween 20 an 29, 21% atween 30 an 44, 19.1% frae 45 tae 59, 3.1% frae 60 tae 64, an 9.7% 65 years o age or aulder. The population growth rate in 2006 wis 5.8%. In 2005, thare wur 11,830 salaried wirkers an 984 sel-employed. The mean monthly wage for a salaried wirker wis NIS 7,597, a 9.2% increase ower 2000. Salaried males haed a mean monthly wage o NIS 9,802 (an 8.4% increase) versus NIS 5,595 for females (a 14% increase). The mean income for the sel-employed wis 7,064. Thare wur 290 fowk receivin unemployment benefits an 986 receivin an income guarantee (welfare). Ness Ziona is hame tae the Israel Institute for Biological Research (IIBR), a chemical an biological research institute wi 350 employees, an Zenith Solar, a solar energy company. The Kiryat Weizmann Science Pairk is a magnet for mony Israeli stairt-ups, amang them Indigo Digital Press, which wis acquired bi Hewlett-Packard in 2002 an manufactures heich-end digital printin presses. Accordin tae CBS figures for 2001, thare are 13 schuils an 5,019 students in the ceety: 10 elementary schuils wi 2,821 students, an 4 heich schuils wi 2,198 students. 62.9% o 12t graders wur eligible for a matriculation certificate that year. The ceety haes been representit in the tap diveesion o Israeli fitbaa bi twa different clubs; Maccabi Ness Ziona competit in the tap flight in the first post-unthirldom saison. Housomeivver, thay lost aw 24 gemmes, an wur relegatit. A new club, Sektzia Ness Ziona wis formed in 1956 an reached the tap flicht in 1966. Housomeivver, thay wur relegatit efter anerlie ane saison. Efter fauldin, thay reformed as Ironi Ness Ziona in 2001, an syne then hae revertit tae thair umwhile name an reached Liga Leumit, the seicont tier. The club plays at the Ness Ziona Stadium, which haes an aa hostit Israel's U-19 team. Ness Ziona haes twa main roads – Heich-gate 42 tae the wast, an Road 412 (Weizmann Street), which goes throu the ceety center an connects tae Rishon LeZion an Rehovot. The Ness Ziona Central Bus Station is locatit on Weizmann Street, awtho as o 2008 it is operational anerlie for buses heidin north, while the platform for buses heidin sooth wis muivit athort the street. Wikimedia Commons haes media relatit tae Ness Ziona. ↑ 1.0 1.1 1.2 "Table 3 – Population of Localities Numbering Above 2,000 Residents and Other Rural Population" (PDF). Israel Central Bureau of Statistics. 2010-06-30. Retrieved 2010-12-10. ↑ 3.0 3.1 Young, Daphne. "Ness Ziona – The Flag of Zion!". Ness Ziona Municipality. Retrieved 2008-10-22. ↑ Lieberman, Guy. "Watch out, Tel Aviv!". Haaretz. Retrieved 2008-04-14. ↑ "Population and Density Per Sq. Km. in Localities Numbering Above 5,000 Residents" (PDF). Israel Central Bureau of Statistics. 2004-12-31. Retrieved 2008-04-26. ↑ "Israel – List of Final Tables". RSSSF. Retrieved 2008-10-22. This page wis last eeditit on 5 Mairch 2018, at 07:38.